In December 2004, Specialist Thomas Wilson, a scout on his way to Iraq with the Tennessee National Guard, caused a media firestorm by asking then-Defense Secretary Donald Rumsfeld about Humvee armor shortages: "Why do we soldiers have to dig through local landfills for pieces of scrap metal and compromised ballistic glass to up-armor our vehicles and why don't we have those resources readily available to us?" Others in his unit agreed that they were undermanned and underequipped. Spc. Blaze Crook, a truck driver, said, "I don't think we have enough troops going in to do the job." Most military experts now agree that years of war and the spring 2007 "surge" have pushed our military to the breaking point. According to General George Casey, the Chief of Staff of the United States Army, "The demand for our forces exceeds the sustainable supply." Admiral Michael G. Mullen, the Chairman of the Joint Chiefs of Staff, has agreed, acknowledging that the current policy of an increased U.S. force presence in Iraq cannot continue past April 2008. The consequences of our overextension are dire. General Peter Pace, former Chairman of the Joint Chiefs of Staff, believes that there is a significant risk that the U.S. military will not be able to respond effectively if confronted with another crisis. By spring 2008, all four brigades of the 82nd Airborne, the Army's rapid response division, will be deployed to Iraq or Afghanistan, leaving the Army without "a rapid response capability for other crises around the globe." Army Lieutenant General Douglas Lute, President Bush's new war adviser, has gone so far as to say that a military draft is worth considering. Forced to fill the ranks without a draft, the military has faced serious problems with recruitment. The Pentagon has responded by lowering age, education, and aptitude standards for new recruits, as well as increasing enlistment bonuses. In March 2007, the National Guard actually ran out of funds for marketing and advertising. The costs of retention have sky-rocketed to over $1 billion, six times the amount spent in 2003. The military has also held 70,000 troops on active-duty beyond their expected contract enddates -- a controversial policy known as "Stop Loss" -- and has called up 15,000 veterans, many of whom have not put on a uniform in years. The military now regularly requires troops to serve multiple, extended combat tours. Over 449,000 troops have served more than one combat tour, and many have returned to war after only a few months rest. Active-duty Army combat tours are now 15 months long, with only half the recommended "dwell time" at home between tours. The increased tempo is expected to have a major impact on service members' health. According to a military survey, soldiers serving multiple tours are 50 percent more likely to suffer from a mental health problem. Equipment shortages have contributed to the plummeting readiness ratings of Army and Marine units, threatening our ability to cope with foreign threats and domestic emergencies. 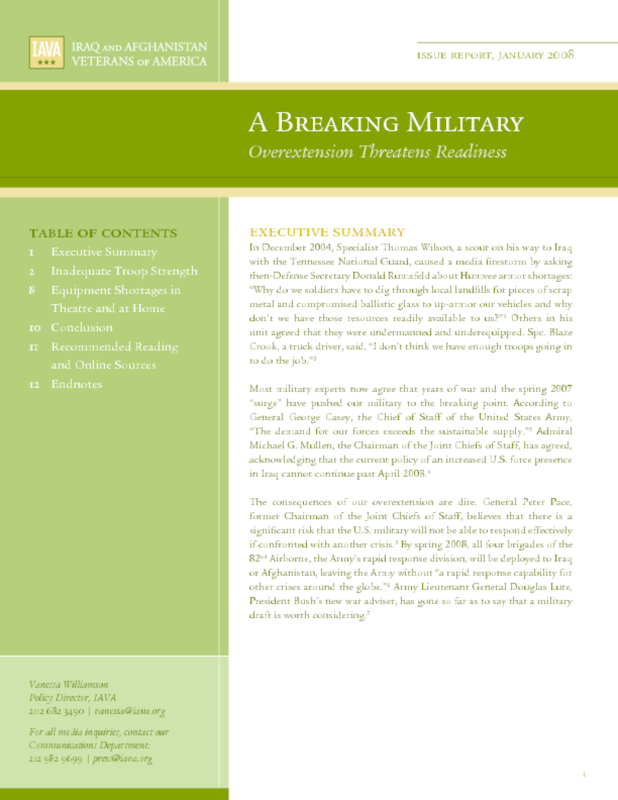 By September 2006, "Roughly one-half of all Army units (deployed and non-deployed, active and reserves) received the lowest readiness rating any fully formed unit can receive." About four-fifths of Army Guard and Reserve units not mobilized received the lowest possible readiness rating. State officials in California, Kansas and Oregon have publicly expressed grave concerns about the damage done to our domestic security. According to the Government Accountability Office, 20 states and territories now have "inadequate capability" to fulfill key domestic security missions. This situation is so dire that, in 2006, all 50 governors signed a letter calling on President Bush to ensure the National Guard is re-equipped. According to Dr. Andrew Krepinevich, President of the Center for Strategic and Budgetary Assessments, "[T]he Army and Marine Corps equipment is in such a state of disrepair that it will take years and tens of billions of dollars to repair or replace." The Army has already received over $38 billion dollars to repair or replace equipment used in Iraq and Afghanistan, and it is estimated that reset costs will be $13 billion a year for the duration of combat.